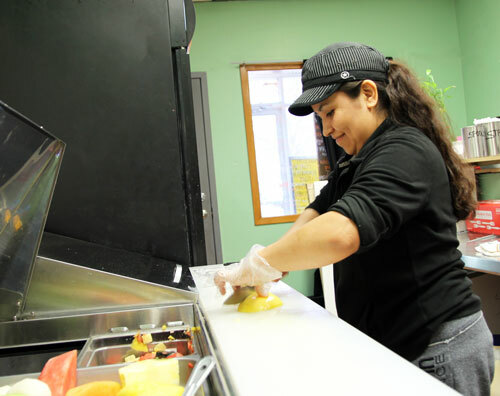 One of SMIF's newest loan clients, Chabelita's Yummy Foods and Fruits, brings more dining options to Le Sueur residents. Raul and Maria Castellanos started out with candy and fruit salad, but a full menu of Mexican dishes is coming soon! “SMIF’s loan is helping us purchase a range hood so we can start preparing cooked food, in addition to fruit," said owner Raul Castellanos. "People often come in asking if we have anything other than fruit because they want more food choices...now we’ll be able to offer more." The Castellanos were living in Minneapolis, where they had a boutique selling clothes, jewelry and cologne. One day, a Facebook furniture find brought them to Le Sueur. The person made a strong case of why Le Sueur was a great place to live - it offered a great quality of life for a much cheaper price than the Twin Cities. Raul and Maria were sold and ended up moving to Le Sueur themselves. They looked at the market and saw a need for more dining options. Initially, they started selling fruit and candy, but a fuller menu is in the works, once the commercial kitchen is complete. "People have been supportive of us, because they want some other dining options," said Raul. Check them out on Facebook and stop by the next time you're in the neighborhood!